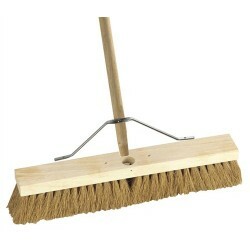 We stock a wide range of brooms and brushes as well as accessories and replacement heads etc. We stock a range of vehicle cleaning brushes from our Vikan range of products. We also stock a range of colour coded brushes for the food industry. Wooden handle. Filled with Black Coco. Overall length 330mm .. Wooden platform stock Filled with Pure Bahia Bass Trimmed at 102mm. Complete with 29mm handle a.. Wooden platform stock. Filled with soft black Coco fibre Ideal for smooth dry surfaces. Trimmed .. Wooden platform stock Filled with Pure Bahia Bass Trimmed at 102mm. Complete with 29mm handle and.. Wooden platform stock.Filled with soft black Coco fibre Ideal for smooth dry surfaces.Trimmed at.. Wooden platform stock Filled with Pure Bahia Bass Trimmed at 102mm.Complete with 29mm handle and b..
Domed wooden head. Two staff holes at different angles. For use with 24mm wooden handle ..
A handy, complete sweeping kit. Easy to hang for tidy storage. Medium bristles only.. This narrow scraper allows access to small areas and rounded equipment like large bowls. It is use..
White with coloured bristles Double sided nail brush Solid plastic construction Available in 4 .. Suitable for sweeping small particles.Can be used where colour coding is required. Can be cleaned .. Suitable for sweeping small particles.Can be used where colour coding is required.Can be cleaned..